Your fave virtual pets & talking pets, Emma the Cat and Oscar, are expecting little kittens! My virtual cat, Pregnant Talking Cat Emma, needs your help to bring little talking kitties into the world of virtual talking pets. Play my talking cat game & join the virtual pregnant cat Emma on her pregnancy journey. Help this my talking cat organize a baby shower, treat your talking kitty cat well and prepare virtual cat Emma to be a mom! Get this my virtual pet game and have fun with Pregnant Talking Cat Emma! My virtual pet games and my talking cat games have just got more interesting because talking cat Emma, your fun virtual pet, is about to have three little talking kitties and she needs all the care a pregnant cat can get. 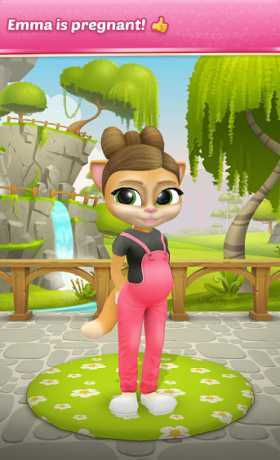 You’ll need to take this pregnant mommy cat to her pregnancy doctor so that the kitty cat virtual pet can do an ultrasound and other check-ups to make sure her talking kitties are safe and sound. But that is not all! Take a look at the features list of this talking cat virtual pet game and make sure you check out every item on there!
? CHECK-UP: take your pregnant cat, a pregnant talking pet for an ultrasound, blood pressure check-up, etc. Oscar the Cat and Emma are super happy to have three little talking kitties virtual pets join their family. With the newborn kittens, the world of virtual pets and talking pets has just reached another level. REMEMBER: you have to take care of virtual pregnant cat Emma, feed her, bathe her, take her to sleep because my talking cat needs all the love and attention a virtual pet can get in this period! You can also make your talking cat virtual pet feel more comfortable by changing her room decor or collecting the items Emma the Cat virtual pet will need once the talking kittens are born. Get Pregnant Talking Cat Emma, a fun talking pet game, and help Emma and Oscar, your favorite virtual pets, get ready for the era of parenthood. Enjoy! Pregnant Talking Cat Emma virtual pet game has been developed by Peaksel and published by DigitalEagle – all rights reserved.